Curator - Benvenuti su urbinoinacquerello! 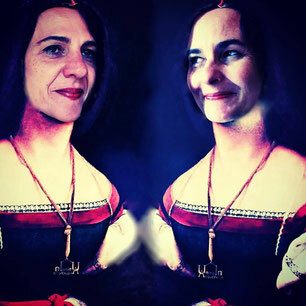 Carla Petrini and Ivani Ranieri are two Brazilian artists, united by friendship and the art of engraving and watercolor for more than 33 years. Throughout this time the artists have been together in collective projects, exhibitions, studies, discussions and experiments in the field of painting and engraving, in Brazil and abroad, as well as following their individual careers, each in their own way and personal projects. Celebrating this meeting once again, they join the curatorship of the Brazilian artists group for the Urbino in Acquerello 2018 Festival. Md. 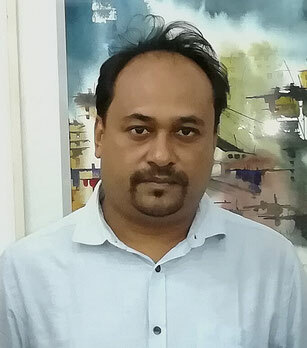 Kauser Hossain Is a creative mastermind who was born in 20th October 1973 and has been working in different medias of art. But among all the other medias of arts his most favorite is watercolor. He has completed his study from BAFA. He had also been to India and Thailand for studying and Diploma Courses. He is the founder of FOCUS BANGLADESH an organization which creates platform for the facility deprived artists. 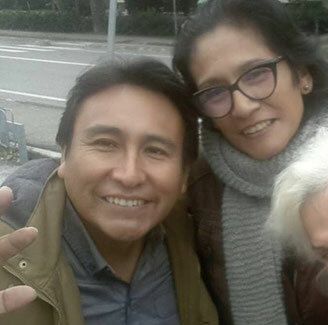 He has been also made the country head of IWS Bangladesh,Country leader of FabrianoInAcquarello, Country Curator of UrbinoinAcquarello, Vice Director, Committee Member and Organizing Committee Deputy Director of 2nd Asian Art Biennale Hong Kong. He has done many exhibitions and biennales in both home and abroad and has got chance to see the art works and masterpieces of the master artists around the world. He has also received many awards from Japan, Nepal ,India and many countries and also got many national level awards. He has performed many demonstrations and workshop in Europe, India, Indonesia and China for the preaching of watercolor. 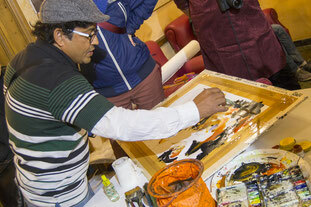 He wants to represent his country, Bangladesh newly to the other countries of the world through his artworks. He has also done may workshop for the promotion of watercolor. He wants to thank all the people who supported him in his journey. He has a dream to establish an art college in the future. 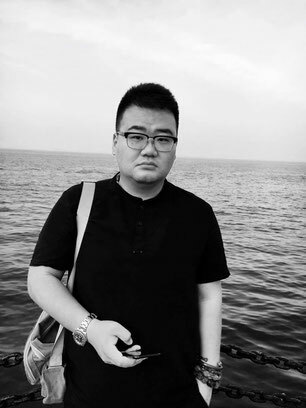 Teng Fei, from Yantai, Shandong,China, has a master’s degree in Arts. He graduated with a Bachelors in Watercolor from the Painting and Art department of Qingdao University (China). He obtained his Master’s degree from the Department of Fine Art in Ludong University (China). His current studies have him studying Art History in Florence University of Italy. He has engaged himself in the study and creation of watercolor and oil paintings for a period of time. · 2017. May. 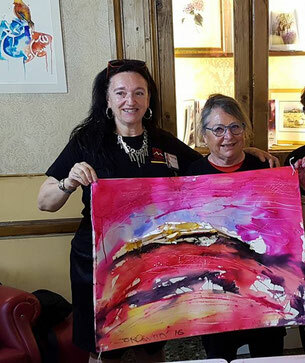 Watercolor work ‘Red Memory Series’ was displayed in Italian Urbino International Watercolor Festival and he was invited to give lectures about watercolor. Have continuously studied and taken courses in watercolour painting over the past six years. A big thank you to Soha Khalil for organizing this year’s Urbino festival. Looking forward to join everybody in Urbino . 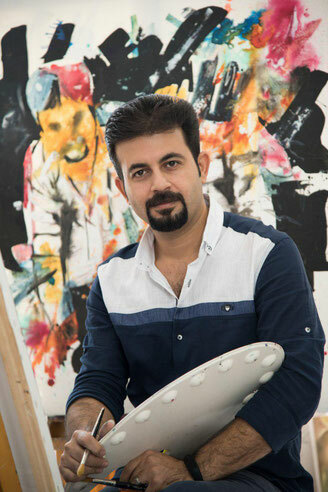 Amit kapoor is a leading master of watercolor medium in India. He is a Vice President of International Watercolor Society (IWS), Founder of Watercolour Society of India. He did his Bachelor’s in Arts in 1998 & Masters in 2004. He has been recognized with top international honors for his paintings like Silver Star Award from NWS, USA and his art graces the walls of many private and corporate collectors. His exceptional drawing skills and extra ordinary abilities in art makes him proficient in any medium. His subjects include lot of compositional works where lovely play of light and shadow and prespectives are the main traits. He is also the co founder and Principal of Anitoons The School Of Art And Animation. He is guest lecturer in many prestigious Art colleges like College of Art, Delhi, Apeejay Institute of Design, Jamia Millia Islamia (Mass Communication department), Meerabai Institute of technology . He was also in the jury Panel of Jamia Millia Islamia (Mass Communication department), in the jury panel of Jaipur Animation Film Festival (JAFF). . 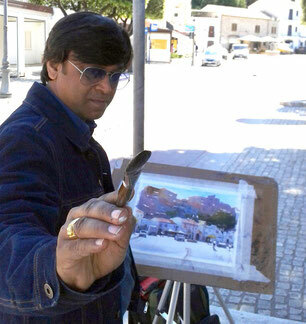 Recently in 2013 he also launched his first book in watercolor medium “Amit kapoor LANDSCAPES IN WATERCOLOR. He is also a Curator of International Watercolor Society India Biennale, India. Soha Khalil is a wonderful person and a organizer. As a woman it's really difficult to organize and look after a big event. Now this is her third edition of Urbino event and I know that now she will take this event at different level. And I want to wish her a good luck. First award in professional J.S.C.A ranchi. Jharkhand pratibha samman in art jharkhand gov. Exhibition - italy. Bangladesh. Jordan. Palash. Rainbow. Academy of fine art. Lalikala academy. Jaipur.kolkata.nepal. Born in 1960, Agus Budiyanto has embraced the world of aquarelle for more than 40 years. He always wanted his paintings to appear different from what is the common rule, both in terms of size as well as in the mastery of techniques. He is also a poet. Had 5 times awards from 1979-1983 as The Best Artist of South Jakarta and The Best Sketch from Jakarta Council of the Arts. A member of Indonesia Watercolor Society since 1998. In 2010 He launched his art book “AquarEvolution” in Nasional Gallery, Jakarta, Indonesia. A Country Leader of the International Watercolor Society Indonesia since 2014. In the past he held 17 solo exhibitions and participated in more than 90 group exhibitions in Jakarta; Bali; Bandung; Korea; Taiwan; Japan; Contemporary Asian Art Fair Singapore; Shanghai; Biennale Internazionale Dell’ Arte Contemporanea Florence, Italia; Thessaloniki Watercolor Salon, Greece; IWS Exhibition in Indonesia, Fabriano, Turkey, Albania, India, Bulgaria, Hungaria, Thailand, Hong Kong, UAE, Kosovo, Pakistan, Bangladesh, Vietnam, Mexico and Jurror of 2015 The International Watercolor Society Competition, Turkey; Urbino in Aquarello 2017 & 2018. • Achievement of title “Special Award” from international Festival of Bornova Turkey 2015, along with cash award and "Golden Brush "
• The selected Person in watercolor Exhibitions of Swiss, Italy (Fabriano and Urbino), Spain, Serbia, China , Bangladesh , Albania, Turkey, India, Ukraine, Hungary , Dubai ,Thailand, Bulgaria, Hong Kong , Ecuador , Indonesia , Nepal , Kosovo ,Vietnam, Portugal, Pakistan countries, etc. fa da riferimento. 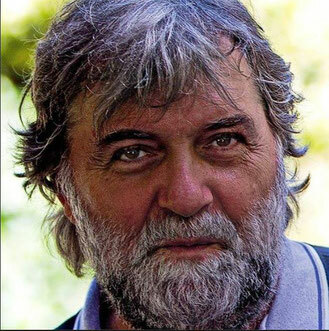 Gorlini è contro l’imposizione di schemi o di formule accademiche. Rosalba Perucchini :Si è avvicinata alla pittura sin da piccola, grazie al padre ed agli zii, Nell'età matura ha scelto la tecnica dell'acquerello. Nel 1999 viene ammessa nell'Associazione Italiana Acquerellisti, fa parte del Consiglio Direttivo dal 2004 al 2008 e dal 2014 al 2016. Dal 2003 è volontaria presso l'Associazione UMAN.A di Milano, usando la tecnica dell'acquerello con i pazienti del Reparto Oncologia, come "arte terapia". Dal 2006 insegna l'acquerello ai bambini delle classi primarie con Progetti e Laboratori in Milano. 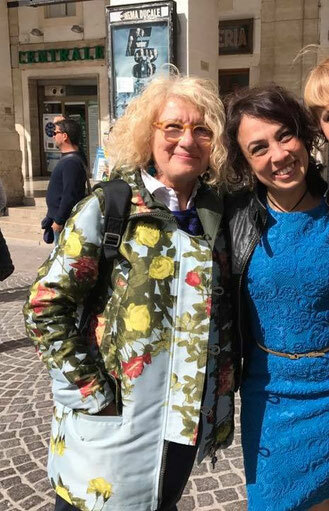 Nel 2012 invitata dal Comune di Belgioioso (Pavia) ha presentato il progetto “Giocando con i colori” e nel mese di settembre con le amiche acquerelliste Emanuela Albertella, Alessandra Arecco e Elena Breda il progetto si trasferisce a Monterosso (La Spezia) dedicando una giornata ai bambini colpiti dall’alluvione con “Acqua e colori”. Dal 2015 al 2017 invitata dall’Associazione UrbinoInAcquerello coinvolge i bambini nella meravigliosa tecnica dell’acquerello con laboratori, trasferendo le magie dei colori e la libertà di interpretazione sulla carta osservando le bellezze che la natura ci offe. Chiayee Lam was born in 1973 in Pahang, Malaysia. 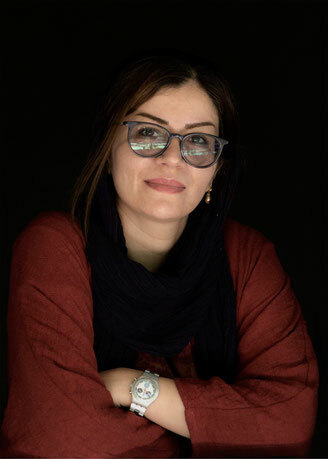 She has exhibited her work in USA, Italy, China, Switzerland, Portugal, Slovakia, Kosovo, Albania, UAE, Hong Kong, India, Vietnam, Thailand, Nepal, Indonesia, Pakistan, Bangladesh and Malaysia since 1996. Chiayee has won North East Watercolor Society Award of Excellence V in NEWS 41th Annual Exhibition in New York, Honorable Mention Award in China Lushan International Watercolor Festival and Honorable Artist Award in IWS Kosovo International Festival, Kosovo. 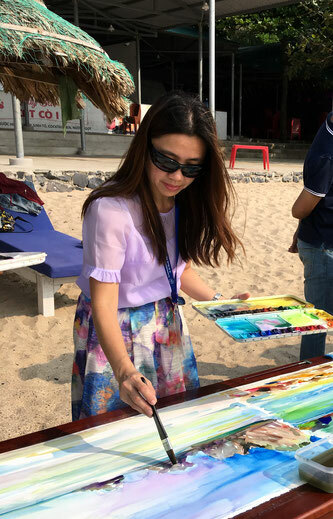 She was invited as an International Watercolor Demonstration Artist in Kosovo, Vietnam and Thailand, her work has been selected in '2017-2018 Lushan International Watercolor Festival World's Best Works Travel Exhibition'. 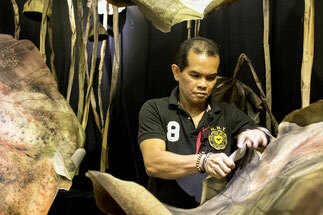 Hanoi Museum of Vietnam has recently collected her work permanently. 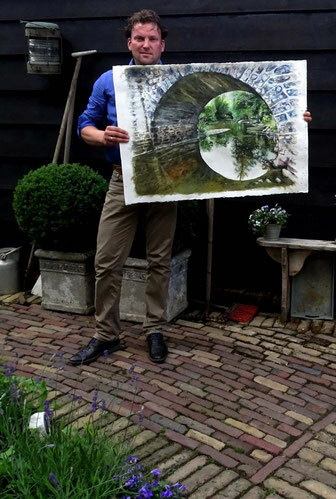 Marco Boer (1973) from Hendrik-Ido-Ambacht makes watercolour paintings since 1997 and from then on he never stopped with this beautiful but technically difficult medium. He has a preference for an abstract reproduction of the real world. Characteristic is his use of a limited colour palette, he subsequently explores to the bone. To suggest and the art of omitting fit him like a glove. The note you do not play often sounds the most beautiful. Saying more with less words. He has been exhibiting many times both nationally and internationally, as member of a group as well as an individual. He has won prices with his watercolours both home and abroad. His works are permanently displayed in the outdoor space of the municipality of Zwijndrecht and Hendrik-ido-Ambacht. These works are public art of both municipalities. Marco is a member (master member) of the International Watercolor Society Globe (IWS) and IWS Holland. He is autodidact. He works on behalf of both individuals and companies. ALI ABBAS SYED : President IWS-Pakistan. Winner,IIIrd International watercolor Biennle 2014 ,Belgrade, Serbia. Great Master World Watercolor Artist Award 2016, HuaHin BluPort Watercolor Art Biennale 2016,Thailand. Curator; PEARLS OF PEACE,!st International watercolor Biennale 2016,CEAD,MUET,Jamshoro Head; Department of Fine Art ,Centre of Excellence in Art & design ,MUET,Jamshoro. He printed 13 Watercolor Books. 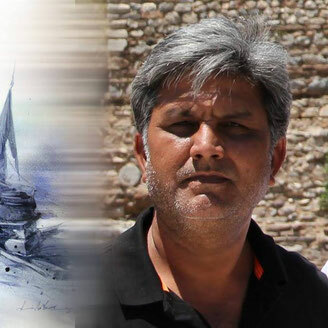 Ali Abbas is a leading Master in watercolour. He has taken part in the jury & workshops ,many group and has had 16 solo exhibitions on national and international levels. Natalia Studenkova was born in Kiev, Ukraine. Now she lives and works in Eastern Slovakia, in the town Košice.Her artistic career started at the State Secondary Artistic School of T. G. Shevchenko in Kiev and continued studying at National University of Technologies and Design in Kiev. She finished her study with Red Diploma. 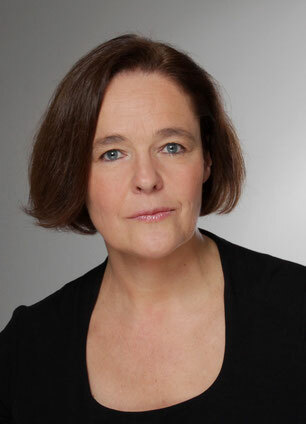 She is a member of Slovak Art Forum. A country head of International Watercolor Society Slovakia since 2016. The Organizer of International Art Symposium INTER-ART-KOSICE, Kosice/Slovakia. The Curator of International Watercolor Exhibition “The World of Watercolor” 2017, Hall of the Ministry of culture of the Slovak Republic, Bratislava.Her pictures blaze with richness of warm, bright colors. They are full of optimistic view of the world.The artist held 20 solo exhibitions in various cities of Slovakia and was also a participant of many international art festivals, plein air and biennale. 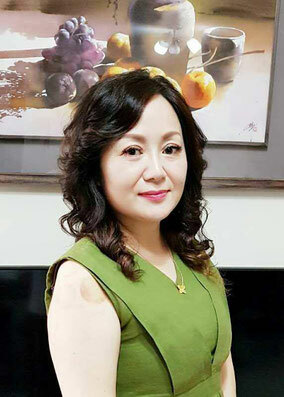 Li Chin, Taiwan professional watercolourist, she is the chairwoman of Taiwan World Watercolor Alliance(TWWA). Victoria Grigorieva is a professional graphic artist based in Kiev, Ukraine. After graduating from the National Art School in Kiev and then the Ukrainian National Academy of Arts and Architecture in 1997, Victoria served as Head Art Director for the Ukrainian women’s magazine Natali and, after, held the same title at The Women’s Magazine. Her works has been exhibited in a number of national and international exhibitions.Publication about Art on 2 pages in international edition: INTERNATIONAL WATERCOLOR ARTIST: HANDBOOK FOR ASPIRING ARTIST AND ART LOVERS” Edited by K Coralee Burch (Italy, USA); Artworks are saved in private collections in Ukraine, Poland, Germany, Slovakia and USA. Victoria’s works are marked with delicate sense of composition and color, high craftsmanship and complete possession of the watercolor technique. Most of artworks are the result of various combinations of art techniques: wet over wet, dry paintbrush, washing with pastel and watercolor pencils using. Working in classical style, she also use the way A-La Prima. Victoria’s works are various in styles: landscapes, still lifes and very refined and emotional portraits. These works quickly take their place in modern space, and at the same time, they well complete interiors of social destination and private homes, executed in different styles.Teaching – is one more kind of Victoria’s talent. Victoria presented her new project - the school of watercolor by Victoria Grigorieva Victory Art School. It was in Urbino with the support of the association held a personal exhibition of the Victoria and Exhibition of the school students! Victoria finds special approach to pupils both on the private lessons and on the group master-classes and helps them to increase their level of craftsmanship. It is a great honor for me to be the curator of the Ukrainian group at the International Watercolor Festival UrbinoInAcquerello. This international project is very important for the development of cultural traditions and interethnic achievements!